There could be some good deals throughout 2019 as they try to make up for people postponing trips until after Star Wars opens. - An all-new nighttime experience, “Wonderful World of Animation” for Hollywood Studios. May 2019. - Star Wars: Galaxy’s Edge rides named “Millennium Falcon: Smuggler’s Run” and “Star Wars: Rise of the Resistance. Disney loves their colons. - Replacement for Illuminations at Epcot will debut in 2020. A temporary show called “Epcot Forever” will debut fall 2019 to fill the gap. - Ratatouille ride will be called “Remy’s Ratatouille Adventure”. Makes it sound like it takes place in Ratatouille. Disappointed there is no colon. - France pavilion will also get a new Beauty and the Beast sing along show. - Canada will get an update to the O Canada 360° Movie. There was also more info on some events happening at the parks, the new resorts at WDW and a look at the gondola for the Skyway. Also, there was an interesting article by the New York Times yesterday about the huge investment Disney is making in their parks with the massive expansions going on. It doesn’t provide too much new information, but it is an interesting read. There is a new piece of concept art for the DL Marvel land, featuring the Spider-Man ride and some maps highlighting the expansion areas for each park. The maps made some news yesterday because the map for Hollywood Studios showed RockNRollercoaster as designated for Rethemeing/Overhaul. Disney then put out a statement saying this was an error and that they have no plans for this attraction. The map was then update with Rockin completely removed as a highlighted item. These maps were most likely created or approved by Disney before being published, so it’s possible (and likely) that they are indeed planning a retheme but are not announcing it yet. Its looking pretty good. The trackless vehicles are perfect for this ride, and I can only imagine what a “Be Our Guest” scene and the final ballroom will be like with a number of “dancing” vehicles moving around the room. Makes me wish they could have done this for The Little Mermaid instead of the Omnimover system. The animation in the animatronics is fantastic, but the models themselves seem a little off. Almost like they tried to make them a touch anime looking or something. It’s also kinda funny to see the imagineers with their Japanese style hard hats on with the chin strap. It’s mind blowing how much more freedom (and money) OLC allows the imagineers for the two Tokyo parks compared to Disney itself in the US. I cannot wait to go there someday. Guess we should enjoy the view while can without thousands of guests ahead of us crowding around and blocking it. 😀 I genuinely don’t know how anyone is going to be able to move for people wanting photos of themselves in front of that thing, let alone all the people queuing to get on it! 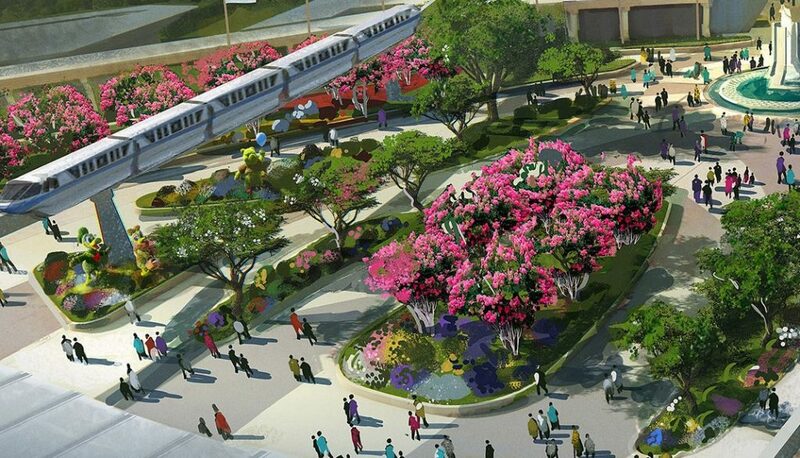 New info and details on the Marvel attractions coming to HK, California and Paris. Notice the world Marvel isn’t used (except in the author’s title and Captain Marvel). Not a heck of a lot here though, except for a broad overview of what’s coming and what characters are involved. New Star Wars video. The lines for this will start before you even board a plane. Really enjoyed the Defunctland podcast interview with the Imagineer behind Trader Sam’s. They always have such great anecdotes. The Paris version of Rock n’rollercoaster will close in September and undergo re-theming as an Avengers coaster. Fate of the Florida version remains unknown (we know that, if it’s rumoured eventual closer is true, that it can’t be Avengers due to the Universal/Marvel fudge). I wonder how far they'll go with it-could just be a simple re-theme with a new preshow and changes to the visual elements, or will they aim to re-track anything? The Florida version isn't a bad coaster in and of itself, but the Aerosmith theme could get changed out for something else without fundamentally changing the ride. Probably closer to a Tower of Terror/Mission Breakout type swap. I think they will do as little as possible to make the changes, so obviously the exterior and pre-show will be changed, but I’d expect the track to be the same but with Hyperspace mountain style projection mapping effects. I’d have to check around but seem to remember reliable insiders saying the Aerosmith contract didn’t have much time left on it which is why there was talk of a re-theme in Florida. I always loved a fan idea of turning it into a Muppet Electric Mayhem coaster (I’d have gone a step further and resurrected the whole Muppet Studios concept around it on that side of the park, but sadly I have to accept that the Muppets are of little value to Disney). That would be amazing, but it's on the complete opposite side of the park from MuppetVision, so unlikely. Still, I'd like to see that version of the ride! You could probably do something with at least one of the Marvel properties there. Maybe a Black Panther ride? Basically, anything that's not in the original Universal license seems to be fair game, given that they can use Guardians of the Galaxy. The armchair imagineer in me would re-house Muppet vision in a new building on the Muppet Studios lot, freeing up space for the old theatre and Star Tours to be demolished and the area free to link to the Indy stunt show for an Indiana Jones land. 😀 A third building on the Muppet Studios lot would naturally house the planned but never built Great Muppet Movie Ride. I was actually going to re-imagine the Studios with all of that in Planet Coaster, especially after they introduced being able to import custom 3D models, but I had to face reality that I’d have never had the time. The problem is the location, though I fear Disney might not even care. Off Sunset Blvd you’d really expect something entertainment industry related, so a music recording studio works, a Muppet movie studio...etc wouldn’t feel out of place. I did check WDWMagic and there doesn’t seem to be any recent talk of removing the Aerosmith theme. It’s probably got at least anothet year of life left in it. No sense closing anothet ride in 2019 when they’re going to need to spread guests out to multiple attractions to ease congestion after Mickey and Galaxy’s Edge opens. It’s almost a strange thought not to think of Hollywood Studios being a partial building site anymore. Given that they just re-themed the Pizza Planet restaurant to the muppets last year though, probably not going to happen. Still, I like the way you're thinking-even if they just ported Temple of the Forbidden Eye to studios beside the stunt show. Studios by the end of this year will definitely be a different place. Last time I was there in 2017, it was basically "constructionland", since at that point you had Toy Story, the movie ride, and star wars all closed off for work (although despite that, my kids both really liked the park). I've got a conference coming up in Orlando in early November this year, and I'm kind of hoping that SW is open by then, since I'd probably try and wrangle an extra day and just hit the one park, knowing full well that it'd be several hours to just do a couple of rides. Pizza Rizzo is barely themed though. It seems deliberately designed to be re-done as and when they so choose, or designed to such a low budget that they don’t won’t take much of a hit if they decide to tear it down someday. There’s pictures on the wall, but it’s a far cry from the original desire of imagineers to animatronic rats deliver your food and talk to you, and have other animatronic muppet characters around the place as entertainment. Nobody seems to rate the food there either. Now that both Pizza Rizzo and Muppet Vision run on restricted hours I suspect time is almost up on the Muppets, though again surely not while they will be looking to spread out visitors during the Star Wars hysteria. I’ll be devastated to hear of MuppetVision going away. Despite my love of the abandoned Muppet Studios concept I do have quite strong reservations about IP themed lands as I think long term it could be perilously restrictive, but it’s at least nice to know that park is finally months away from being a fully formed placed to visit again, even if it looks like there’s going to be a weird disconnect as you walk from one section to the other. If they did an Indiana Jones land I think porting the coaster from Paris/Disney Sea wouldn’t hurt, although it is very short in length and spectacle, and I guess the Studios has two coasters already. The park needs a water ride though and that’s actually what Indy ride runours were pointing too which I always thought was interesting. I had no idea that those muppet attractions were on restricted hours. Muppetvision is, sadly, showing its age quite a bit. It's not bad per se, but it's yet another 3d movie attraction in a time when 3d just isn't the "holy crap" feature it used to be. The bits with the live sweedums are fun, and the animatronics are a nice touch, but when the star of the show is the 3d movie, there's not much you can do. If it goes, it's probably more to do with the attraction type rather than the muppets, kind of like how T2:3D got closed (and I think still left vacant). They're still running the muppets' "Great Moments in History" shows in MK though, which are fun if you happen by them. 1) Gore-tex shoes, and a backup pair of socks if need be. 2) I love a good water ride. Love! Whether coming from England’s weird climate to somewhere freakishly warm adds to their appeal I’m not sure. Also, you don’t HAVE to get soaked on these kind of rides. You get by OK on Pirates despite the drops, and in my mind I envision an Indy water ride being more like that, perhaps even using the technology of Shanghai Pirates. 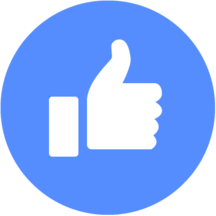 Yes I’ve liked what I have seen of the Great Moments thing. Cute idea. There’s rumour of something like that happening in the new Grand Avenue section of the park to keep the people waiting for hours to get into Galaxy’s Edge entertained. The loss of Muppetvision will hit me hard as I’m such a big Muppet fan and admirer of Henson, and it being the last Muppet project he completed gives it some historical value. I’ve often wondered if it could be preserved on Blu-Ray somehow, using surround sound to simulate the placement of Statler, Waldorf, Bean and Swedish Chef’s in theatre moments in your living room. I suspect that’s more effort than Disney is willing to put in, even though I am sure they will preserve the film in their own archives. T2 is still vacant but something is definitely happening in there. Construction is going on but nobody knows for certain what it’s going to be. A Bourne show is the regular rumour. Personally I think licensing Mission Impossible from Paramount would be far smarter, and more relevant since it’s an ongoing series. I’d expect whatever it is to open this year as a distraction from some of Disney’s new attractions, alongside the new Potter coaster at Islands. I guess I don't consider things like pirates to be water rides (even though they happen on water). Yeah, you might get a little wet, but nothing that you can't deal with. Even Splash Mountain isn't that bad most of the time. Any of the river rapids rides though (e.g. Grizzly River Run, Kali Rapids, or Bilge Rat Barges) just get you drenched. If you go in prepared, they can be fun, but it means hauling dry stuff with you, and making sure you're prepped to get soaked. I suppose what I don't like is that they take a level of commitment and planning that most other attractions don't. Seems like it'd be much better to have things like this focused in a waterpark environment, where you're prepared to be wet all day. This seemed like where they were going with Volcano Bay-having more to a "water amusement park" than just simple waterslides. For the muppet stuff, does the 3d film not exist in any official form? I know the T2 one was an extra on one of the DVD releases at one point. No offical release, no. Disney never even bothered completing the season DVD sets of The Muppet Show (and the last set they did was a decade ago). They don’t care. I don’t think T23D was ever released. The DVD had a making of, but not the footage itself. Footage from Back to the Future: The Ride was assembled and included on the DVD and Blu-ray for that, however. 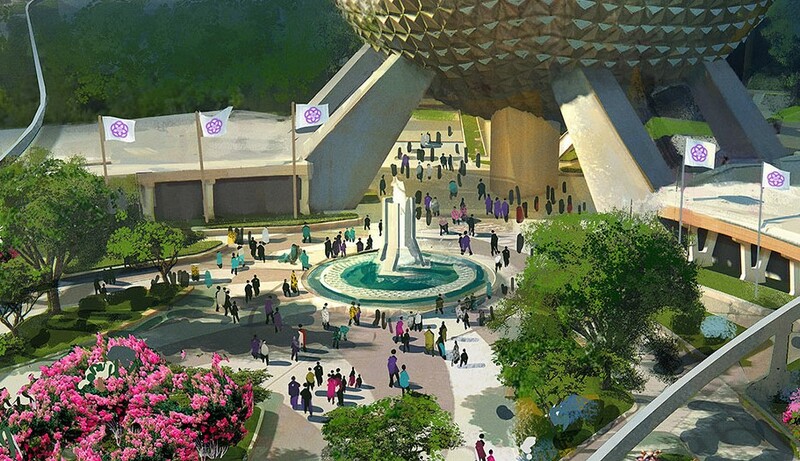 Concept art for the new entrance plaza. 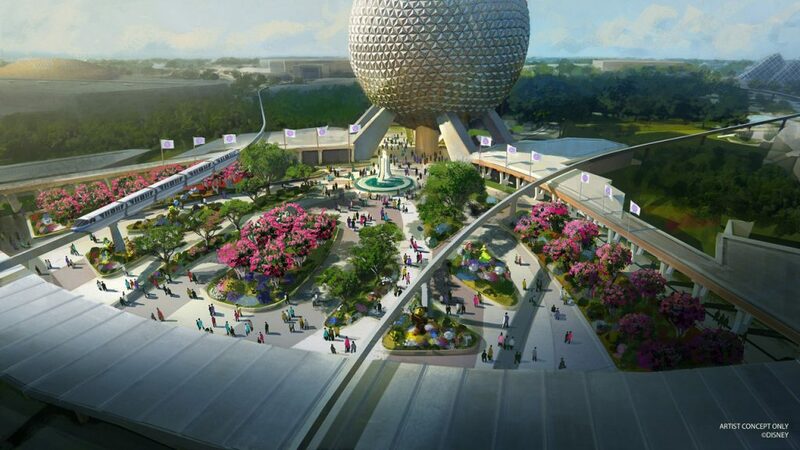 ....changes are coming to the Epcot main entrance, where the plaza will welcome guests with new pathways, sweeping green spaces and a newly reimagined fountain. This new design will pay homage to the original park entrance with fresh takes on classic elements. I like that. It’s not too dissimilar to how it was in the 80s and early 90s. If Disney are also as committed to the old EPCOT logo on those flags as the artist clearly was then that’s a lovely bonus. That's all rather vague, but certainly interesting. It'd certainly be nice if they announce some kind of ride for the pavilion in the near future. It does kind of sound like it will only take up a portion of the Wonders of Life pavilion as the new 'Odyssey Events Pavilion' name would suggest a section of it will still be used for their seasonal festivals. I wonder if they'll re-use the body wars simulators for something else in that space, or come up with something new? I thought I'd read at one point that the sims got cannibalized for Star Tours maintenance. That’s right, the Body Wars simulators were gutted out a good while ago now. Pretty sure there is a video on Youtube of a kid breaking in and showing what was left. 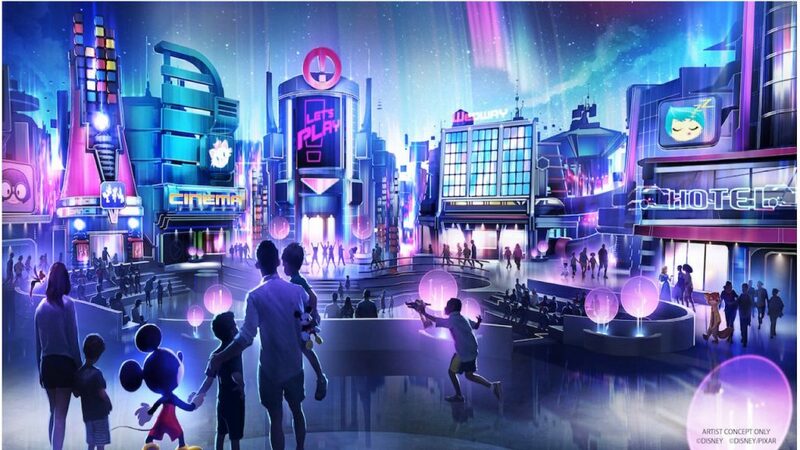 There’s some hints on forums that there will be some kind of attraction in there the pavilion, but it certainly won’t be an “E-ticket.” The central premise really just seems to be an interactive experience of various IP themed displays.